England 1st and 4th, Scotland 2nd and Ireland 3rd, with Lion (English) and Unicorn (Scottish) supporters, and the English Royal Crest (crowned Lion Passant Guardant on a Royal Crown). Motto: "Dieu et Mon Droit" = "God and My Right" (English). This is the form used in England and Wales and to symbolise the UK overseas. Scotland 1st and 4th, England 2nd and Ireland 3rd, with Unicorn supporters bearing lances flying the Andrew flag and the Scots Royal Standard (respectively dexter and sinister). The Crest is the Scots one: a lion sitting (on a crown) facing the viewer and holding a crown and sceptre. The motto is the Scots one: "Nemo Me Impune Lacessit" = "No One Insults Me With Impunity". This is the version used in Scotland only. Of course these flags should only be used by the Queen. Incidentally, the other members of the Royal Family, whose arms and banners are the Royal Arms with labels of cadency, use the English version in Scotland - only the Queen uses the Scots version. There is one exception: the Prince of Wales has a distinctive personal flag for use in Scotland, being a banner of the arms for his Dukedom of Rothesay and Lordship of the Isles. Why do we have two versions of the Royal Arms? Simply that when England and Scotland united in 1707, the Scots retained their distinctive legal system, complete with their own heraldic authority, the Lord Lyon King of Arms, quite separate from the College of Arms in London, whose writ does not run north of the border. Consequently each jurisdiction has its own version of the Arms, with its particular local heraldic flavour. Variations of the Royal Standard as personal banners of members of the royal family (see below) are a relatively recent phenomena. Until Edward VII changed the way in which the Royal Standard was used, most other members of the royal family used the Royal Standard undifferenced. Who designed the Royal Standard in its current form? The Royal Standard which is a banner of the Royal Arms is an heraldic arrangement of the Arms of England, Scotland and Ireland. They were put together in their present form in 1801. At that time there was an additional shield in the centre of the standard representing Hanover, but it was removed in 1837. The particular style of the present Royal Standard dates from 1957 when Sir George Rothe Bellew, Garter King of Arms, revised the design. It may have been done by him, or by one of the Heralds at the College of Arms. Which standard is used by the Queen as sovereign of the crown dependencies Jersey, Guernsey and Isle of Man? This isn't a definitive answer, but the two bailiwicks of the Channel Islands are dependencies of the English Crown ("1066 and All That"), so I can't believe it would be anything other the English version of the standard. And I'm pretty sure that Man's dependency is either on the Crown of England or else the Crown of the U.K., so, again, the 'default' English version would apply. The Royal Standard in its present general arrangement dates from 1801 when the French quarter (2) became Scottish, the Anglo-Scottish quarter (1) and the Hanoverian quarter (4) became English, and Hanover became an escutcheon of pretence. Changes were made in 1816 when the Electoral Bonnet ensigning Hanover was replaced by a Royal Crown, and on Queen Victoria's accession to the throne in 1837 when the ensigned escutcheon of Hanover was removed. In 1901 a Parliamentary Counsellor suggested that these alterations were not done in accordance with constitutional rules. Under Article One of the Union with Ireland Act, 1800, the flags and banners of the newly created United Kingdom were to be appointed by Royal Proclamation. The Law Officer wrote, "It is a well known constitutional rule that where a power is granted by Parliament to the Crown, that power is exhausted by its first exercise. In accordance with this constitutional rule the various alterations or additions which have been made to the Royal style and title have always been authorised by special legislation (eg. 39 & 40 Vict. c.10, and 1 Edw.7. c.15). It appears to me that any alteration of the Royal Standard, on which the Royal Arms are blazoned, would require similar legislation." He was referring to a proposed alteration which did not take place, but his opinion would seem to be equally applicable to those alterations of 1816 and 1837. As with any Arms, representations of the Royal Arms do not all have to be identical, providing that they correspond with the blazon of the Arms, and conform to heraldic practice. Similarly the Royal Standard, which is a banner of the Royal Arms, does not have to exactly copy the Arms. Some changes have become established features. In 1906 Sir Alfred Scott-Gatty, Garter King of Arms, criticised the appearance of the Royal Standard and offered to correct and improve its design, pointing out that the "lions of England and Scotland ought to be armed and langued azure". The charges were redrawn and enlarged, and the lions given blue claws and tongues. "Das Grosse Flaggenbuch (1939)" re-print shows the red unchanged on plate II, but seems to reflect the 1937 alteration to crimson on the next page. Campbell and Evans (1965) "Book of Flags" appear to be reluctant to acknowledge the more contemporary artwork of "Flags of All Nations (BR20)" (1957) and copies Flaggenbuch instead. Just about every aspect of Great Britain's Royal Standard had altered and yet a British publication 8 years later could not report the facts to the general public accurately. Or so it would appear. The harp appears in two different forms. On the Arms it is often a plain Gaelic harp, which fits more neatly into the triangular space on the shield, but on the Standard the frame of the harp is usually in the shape of a winged-female. In 1954 the Queen had expressed a preference for the Gaelic harp, and it was assumed that this style of harp would appear on all future Royal Standards. The 1956 edition of Flags of the World by H.Gresham Carr noted this and had black and white drawings of both harps, while on the coloured illustration of the Royal Standard the harp was changed from winged-female to Gaelic. Somewhat surprisingly, when a revised Standard was introduced a year later, it had a winged-female harp. However some Gaelic harp Standards were made. A Gaelic harp was seen on the extra large Royal Standard flying over Buckingham Palace to-day (16 June) for the Official Birthday of HM the Queen. In February 1957 Garter submitted a new version of the Royal Standard. It was approved by the Queen in July. 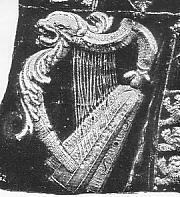 The harp was a winged-female, but the lower half of the forepillar was the same as that usually seen on the Gaelic harp, rather than the elaborate swirls of the traditional winged-female harp. The tail of the Scottish lion was simplified, and four additional flowers added to a widened tressure. The already elongated English lions were stretched even further. In general the changes appear to have been made to follow the heraldic principle that a charge should cover as much of its field as possible, though the new winged-female harp is smaller than previous winged-female harps. It was probably at this time that bright yellow replaced the previous dull yellow. On the Royal Arms and Standards the only harp that I have seen, that is not Gaelic or winged-female, is the harp on the Arms of the Stuart Kings. It had the head of a beast and no wings. The head does not look much like a lion and is possibly meant to represent the onchu, a mythical Irish beast. This version of the harp is shown for James I (England/France, Scotland, Ireland, England/France) and for William III (same, but square overall and with Orange inestucheon). The beast almost seems to have a bear's face, facing the viewer, with three proturberances below, almost like a female human's breasts, each lower than the other. "The earliest representation of the symbolic harp - as on Henry VIII's coins and his immediate successors - show the instrument with a plain forepillar. By the seventeenth century, the top of the pillar, where the neck joins it, is frequently shown to terminate in a grotesque head, the head of a beast resembling perhaps a dog or a fish. Such a head appears on the harp figured in the coinage of James I and Charles I. It appears again on the harp shown on a herald's tabard of 1677-86. One hesitates to suggest that the beast so represented is a reincarnation of the mysterious onchu. Meanwhile, from at least the the second quarter of the century forward, the head is shown in some of the harp symbols as that of a human female figure." mystery any longer, would it? Concerning the onchu, this image is the harp on the Royal Arms which form the tabard of Sir William Dugdale, who was Garter King of Arms from 1677 to 1686 (from photograph Fig.14 in 'Complete Guide to Heraldry' by A.C. Fox-Davies). Hayes-McCoy makes other vague, very uncertain references to the onchu. The word has also been translated as "standard, ensign or flag", and there may be some connection with the Dragon Standard of Wessex which was Harold's standard at the battle of Hastings. When Queen Victoria, King Edward VII and King George V died, one Royal Standard was flown at full-mast by the succeeding Sovereign, and a second Royal Standard was flown at half-mast for the former Sovereign until the day of the funeral. When King George VI died in 1952, a Royal Standard was flown at full-mast for Queen Elizabeth II, but the expected Royal Standard was not flown at half-mast on Victoria Tower while the former King's body lay-in-state in Westminster Hall. The official explanation for this new practice was that since the Crown is never extinct the Royal Standard should never be half-masted. The same new practice was adopted when Queen Mary, wife of the late King George V, died in 1953. Her personal standard was struck and not flown at half-mast, although in 1925 the personal standard of Queen Alexandra, wife of the late King Edward VII was flown at half-mast from her death until the day of her funeral. In this case Garter, King of Arms, Sir George Bellew, contended that the dead could not fly flags, half-masted or otherwise.